Any seafood list is incomplete without prawns or shrimps in it. I can turn myself into a full time vegetarian but huhh…shrimp and crabs won’t allow me to do that. Many parts of the world enjoy delicacies made up of dried seafood. And many don’t like it because of obvious reason, yeahh.. it is too smelly. But like I mentioned in my earlier blog, it is all about how you cook it. I personally don’t have any soft corner for dried fish but this one is my favorite. There are two kinds of dried shrimps, one is kind of bigger in size and red in color and other is comparatively small and white in color. At my native place, we call the bigger one “Karandi” and the smaller one “Jawla”. 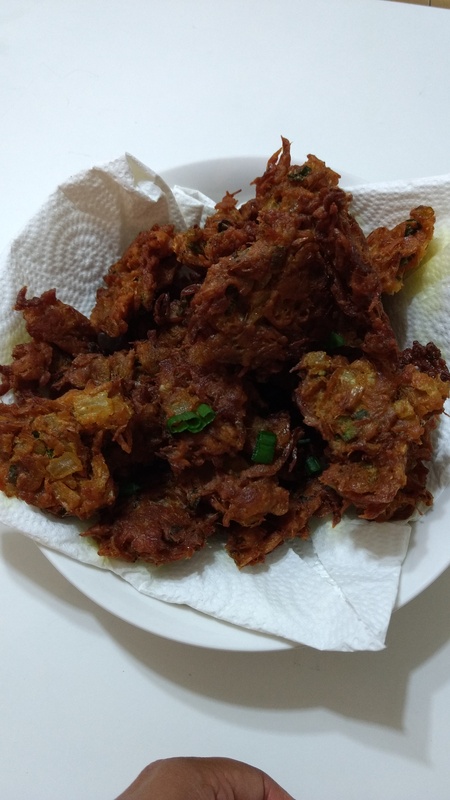 Today I am sharing with you another fritter recipe, which is made up of Jawla (small dried shrimp). 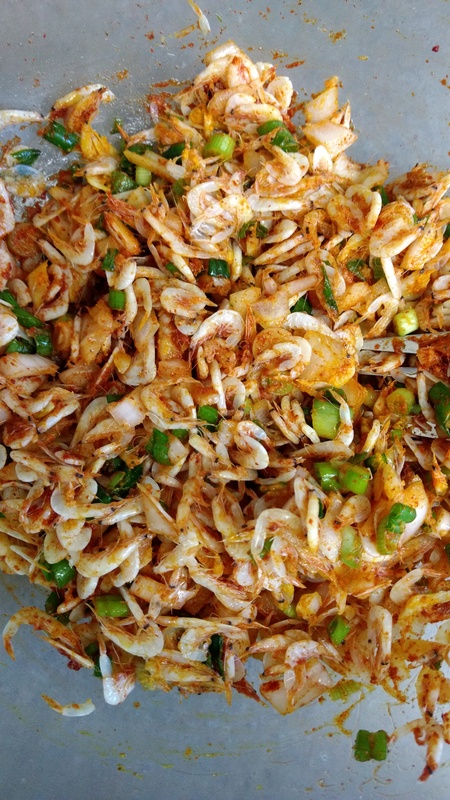 Please do not try this recipe with karandi (big dried shrimps), because it will not fit in this recipe because of its size and hard shell on it. 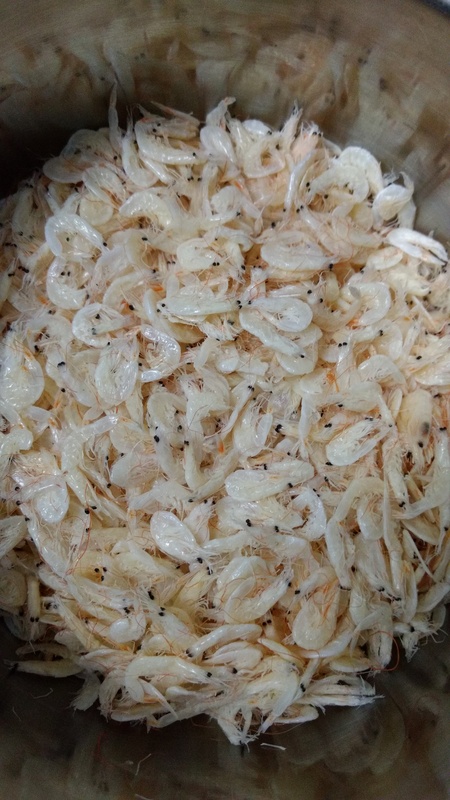 This is the first and very important stage, keep dried shrimp in hot water for ten to fifteen minutes and then drain the water. The reason behind this is, when you cook dried fish, it smells a lot that some people can’t bear it. So if you keep it in hot water for sometime, it won’t create such a problem. 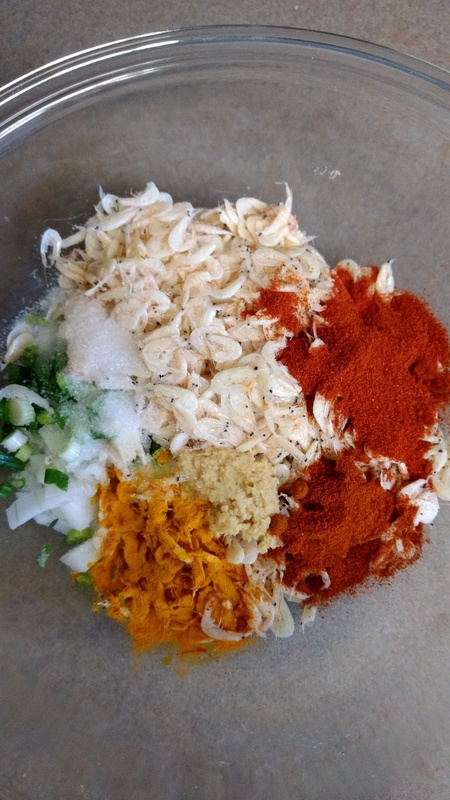 Now mix these shrimps, spring onion, ginger garlic paste, turmeric, chili powder, curry masala, salt in large bowl and keep it aside for fifteen to twenty minutes. Onion and salt will start releasing water and we won’t need extra water in the batter later. 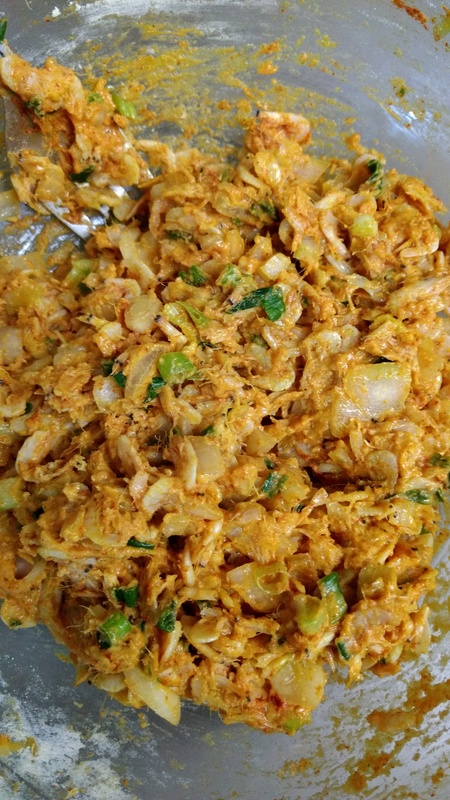 Now add gram flour and mix it well. The batter should be sticky so that you can drop it in hot oil with spoon. But at the same time it should not be runny. (Refer the picture below). Scoop one spoon of batter and put into hot oil and deep fry until it turns brown. Serve hot as a snack or an appetizer. This entry was posted in Appetizer, Snack and tagged food, foodblog, fritters, indian, konkani, prawns. Bookmark the permalink. Best dish to welcome rainy season !!! Never tried. But will give a try this season.